It’s a great time to start a company. Incubator labs are springing up all over the place, sponsored by venture capitalists and universities. Universities are teaching entrepreneurial skill, and have programs to sponsor student start-ups. Massive layoffs over the past two years have forced new college graduates, and experienced former employees to strike out on their own. The emergence of social media and mobile platforms are providing thousands of start-up opportunities, and you can see them showcased at “network and launch” events such as the Web Innovators Group and Mass Innovation Nights. Most of these start-ups will start life as virtual companies, but at some point they will have to lease space, and acquire office furniture for their growing company. So, how do these companies go about finding a source for office furniture? A thorough examination of the data shows that there are 21 categories of search behavior in the office furniture data set. Understanding what’s going on in these categories is very valuable, because it provides opportunities to develop custom landing pages that mirror user intent. Several of the high-level search behavior categories have numerous sub-categories; the most prominent is the type category, which has 11 sub-categories of search behavior. The type category with 23 million monthly searches is very prominent, and should be a major focus for information architectural design. The next largest category reflects searches forhome-office products and services – coming in at 2.5 million searches a month this is certainly a landing page opportunity. 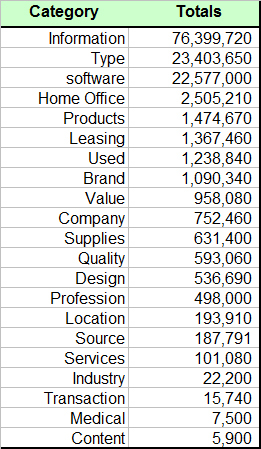 There is a lot noise in the office furniture AdWords data. This noise is primarily in theinformation and software categories. Because the word “office” is somewhat generic, and has multiple meanings, it can be somewhat problematic for search engines. For example, it is widely used by Microsoft to describe its suite of business software, and it’s also a very popular TV program. The 22 million searches in the software category are almost entirely for Microsoft office products. If you do a search on the term office you will see that both the TV show and Microsoft products dominate the results set, however there are results for an open office design website, and for an office furniture website. Informational searches account for 76 million queries each month even though there are only 17 keyword phrases in this group. 80% of the traffic is associated with the term office. As noted before, the single-term query office has many meanings, and can be problematic for an office furniture vendor. When you review all the sub-categories you see that there are actually 36 distinct categories of behavior, with the type group dominating the list. This list illustrates what behavior is most important when consumers search for office furniture. The following model reflects category traffic in descending order with Information having the most, and Content having the least. Most of the categories are one dimensional, however there is a lot of complexity in the Type category. To read the rest of the article please go to Search Engine Land where I first published this analysis. Brent Raymond – Phenomenal article! This should be a thesis for IA relevancy.